Nice quality and just the right weight. Goes perfectly with my farmhouse decor. Love the colors and patterns. Only issue I had was some small aqua spots in the chenille strips on the comforter...appear to be just spots in the thread. Not a deal breaker, I can just trim them. Overall, would recommend. Bring a soft, mid-century look to you bedroom with The Curated Nomad Clementina Cotton Comforter Mini Set. The ivory cotton comforter features geometric prints with tufted chenille that adds dimension and charm to the bedding set. Hidden bartacks give the comforter a duvet-like finish, while the solid ivory reverse complements the eye-catching patterns seen on top of the bed. Two cotton shams reiterate the designs of the comforter, creating a stunning coordinated look. Made from 100-percent cotton, this comforter mini set is machine washable and offers a refreshingly soft update to your bedroom decor. This is a lovely comforter set. Unlike many full/queen, this actually provides enough coverage on our queen bed. The shams are perfectly styled to complement the comforter. It appears to be well made and good quality. We are very happy with it. Just received this in the mail today and was pleasantly surprised. I was a little reluctant after reading the reviews on this comforter set. People were saying that the comforter itself wasn't soft and that it didn't seem to be made well. I have to disagree, the comforter is very soft and looks well made to me. I haven't used it yet, but it's exactly what I wanted. 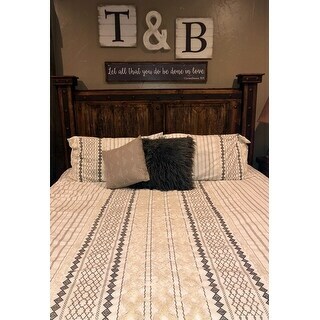 Love this Comforter and is perfect with my decor. Lots of texture and chenille middle make this comforter feel high end at an affordable price. Will add pictures later. It’s a great look for any room and bed, as it does appear like it does in the pictures. It’s not necessarily the softest comforter set, but esthetically it is very appealing. If you’re using it for decor, rather than functionality, then this is a great comforter to get! I’ve had my eye on this comforter for awhile and I finally just went with my gut and I’m so glad I did!! I love it!! It feels like it’s great quality and that it will last a long time, which I’m excited about! This comforter set is great. I love the detail on it that gives texture to my bed. It is kind of thick so it can get a little warm at night but I'm ok with that. I Love this bedding. I needed something to brighten up the brown walls, and this bed spread was perfect- Still waiting for my overstock curtains to come in to finish the look, and might add a few more accent pillows, but it’s super comfortable, and not weighted down (which my husband loves). Gorgeous comforter set. Very well made with interesting texture down the middle. Nice comforter but beware there is a rust color in it (not pictured.) If you don't want this color, do not purchase it bc, Overstock will charge you a return fee. This set is beautiful. I bought the king size for my queen because I wanted it to be a bit oversized!! This is a beautiful set and makes the guest room look amazing!! Perfect fit in my bedroom! This is the most beautiful comforter in my house! I purchased it for a guestroom and it makes the room feel very cool and inviting. I will purchase the sheet set as soon as I find it on sale. The grey does look more like a navy blue but it’s still beautiful!! Really happy!! "Is the king an actual comforter or duvet?" This is a comforter set. "How does this wash? Did it shrink at all?" It washes fine, did not lose its color, however it did shrink a little. 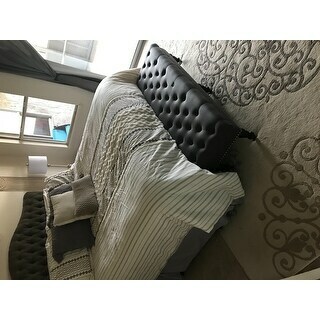 I purchased a King for a Queen bed and was glad I did. The bed is taller than most though. I am purchasing this piece to use while traveling on holiday. We are staying at an air b n b and I always love to take a piece of home with me in every trip. I must find sheets that compliment this comforter before its time to leave! I think it is beautiful! "What other colors are in this comforter besides ivory? Taupe? Grey?" There are hints of Grey. "Where can you get the other awesome pillows in the picture??" Unfortunately, the other pillows in the picture cannot be purchased; they are solely used for marketing purposes to compliment the set.